Our sun protection policy aims to protect children and staff from harmful sun radiation from October to April. Getting too much ultraviolet radiation from the sun can burn or damage our skin and increase our risk of getting skin cancer. When does the sun protection policy apply? Our sun protection policy applies daily during the daylight saving months (October to April). We follow the policy while children are at the Centre and on outings. ‘Sun-unsafe’ days occur when the advertised burn time is less than 30 minutes. The sun is also ‘unsafe’ between 10:30am and 4:00pm from October to April, especially when there are few (or no) clouds. Apply sunscreen to your child’s skin either before, or when, you arrive at the Centre. The Centre has sunscreen you can use in a container next to the sign-in sheet. If your child is allergic to Sunsense SPF 30+ sunscreen (“Ultra” for over 2-year-olds and “Sensitive” for under 2-year-olds), you’ll need to give us another sunscreen (in a named bottle) that we can use. Stamp your child’s hand (using our centre’s stamp) to show that you have applied sunscreen. Provide a named sun hat. This hat must protect the child’s face and neck. Sun hats remain at the Centre, in your child’s tote tray. Dress your child in clothes that cover and protect their shoulders, chests, and backs. For example, they should wear t-shirts, not sleeveless tops. Encourage your child to wear sunglasses. Promote our sun protection policy. Sunsense SPF 30+ sunscreen —“Ultra” for over 2-year-olds and “Sensitive” for under 2-year-olds (or another sunscreen supplied by a parent). Model ‘sun-smart’ behaviour. Always use sunscreen yourself and wear sun hats and protective clothing outside on ‘sun-unsafe’ days. Apply sunscreen generously to children’s faces (including back of the neck and ears) and exposed limbs. Reapply sunscreen after lunch at around 1pm on a ‘sun-unsafe’ day. The New Zealand Cancer Society advises that sunscreen works best if it’s applied about 15–30 minutes before going out in the sun. Stamp each child’s hand again to show you’ve reapplied sunscreen. Reapply sunscreen to children at any time during the day as necessary. 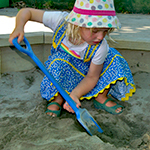 The Centre provides shaded play areas outside in the veranda, sandpit, playhouse, and the large play cubes. We plan our outdoor activities so we’re out in the sun as little as possible between 10:30am and 4:00pm. We usually encourage children to be indoors between 12:00pm and 1:30pm on most days. We remind parents, whanau, and caregivers about this policy in our newsletters and notices. We also include the policy in our curriculum teaching about sun protection.